We encountered three patients with chronic interstitial pneumonia with many bullae in the lower lung fields whose lifetime occupation was teaching school, Pathological examination of autopsy lungs of these patients revealed interstitial pneumonia and multiple bullae throughout the lungs, including the lower lobe. Since blackboard chalk has been used as a popular writing material among teachers in Japan, the mineral contents in the lungs of two of the three cases and four control cases with idiopathic interstitial pneumonia IIP) (whose occupations were not teaching) were analyzed. The amount of deposition of total dust inorganic dust non-SiO2 inorganic dust, and calcium was significantly higher in the lungs of two schoolteachers compared with those of the control lungs. ne amount of free silica in case 1 and alpha-quartz in case 3 were also significantly higher than in the controls. 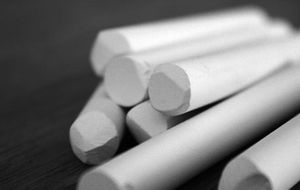 Two thirds of the chalk produced in Japan is still made from gypsum and involves small amounts of silica and other minerals, in addition to calcium. These findings indicated the deposition of chalk in the lungs of these patients with interstitial pneumonia and multiple bullae.